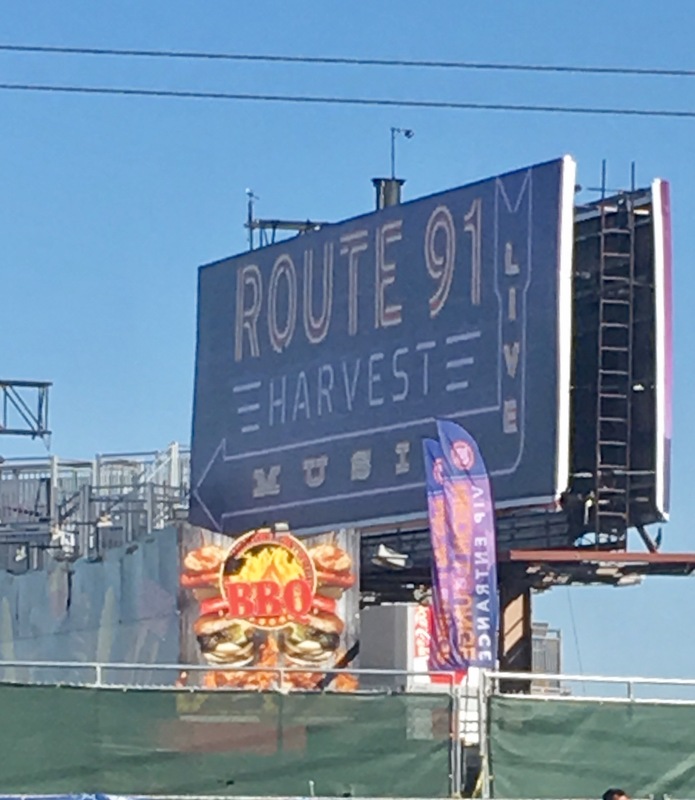 Vegas: Off the Strip, Part One – Eat, Drink, and Go! 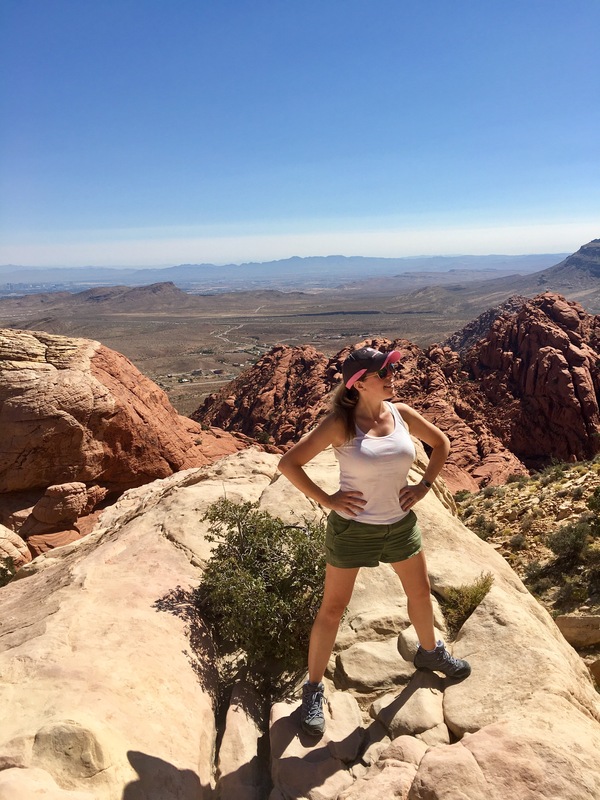 If you’ve followed my blog for a little while, you know I love Las Vegas. And I love variety in my food, drink, and travel theme. 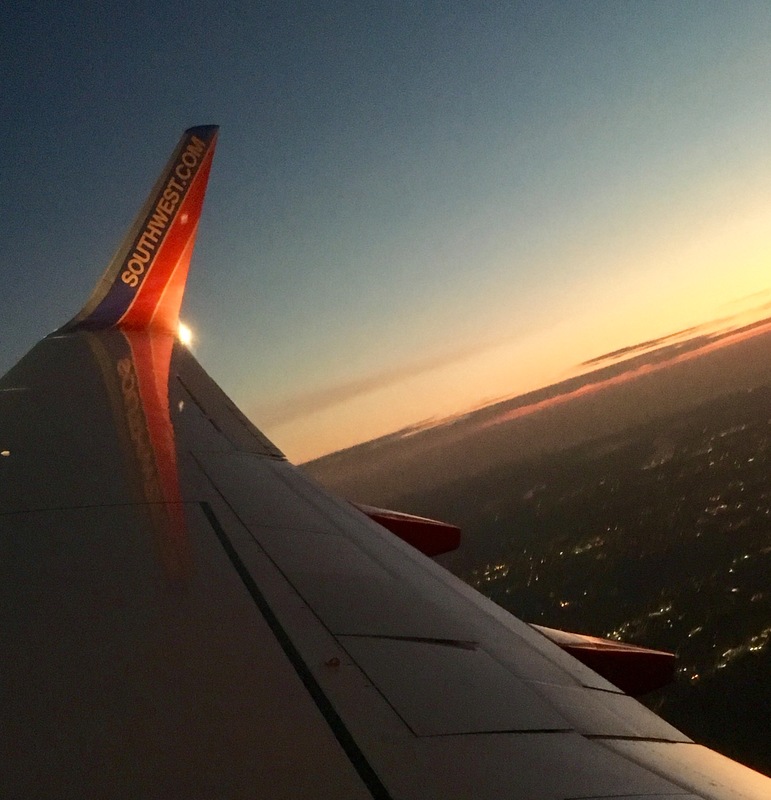 As many times as I’ve been out there, one of my favorite things about Vegas is how many different ways there are to “do Vegas.” We flew out super early to maximize time on vacation and took off at dawn on my favorite airline, Southwest. The first thing different for me this time was that I rented a car. I knew we’d be off-stripping a good bit (not to be confused with stripping off a good bit) and it’d be more economical to just have our own car than trying to day trip through tours or uber. And parking cost wasn’t bad at the hotel either. 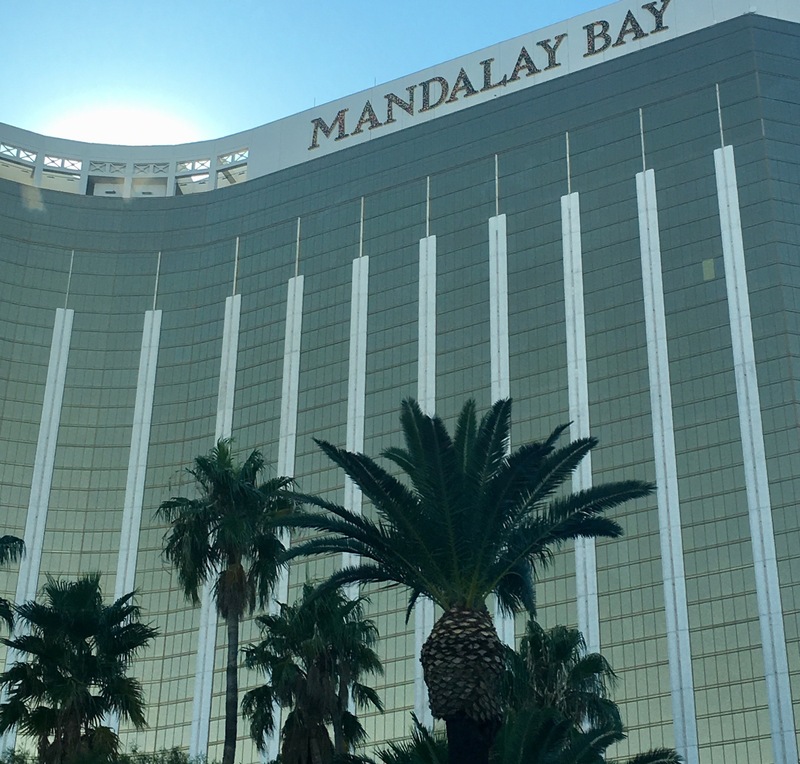 Driving from the airport to the strip is quite quick, but as we approached and the first hotel we came upon was Mandalay Bay, a twinge of pain tugged at my heart thinking about the tragedy that struck this great city so recently. My heart aches for the victims and families, but smiles at the vast showing of heroism, kindness, and love. 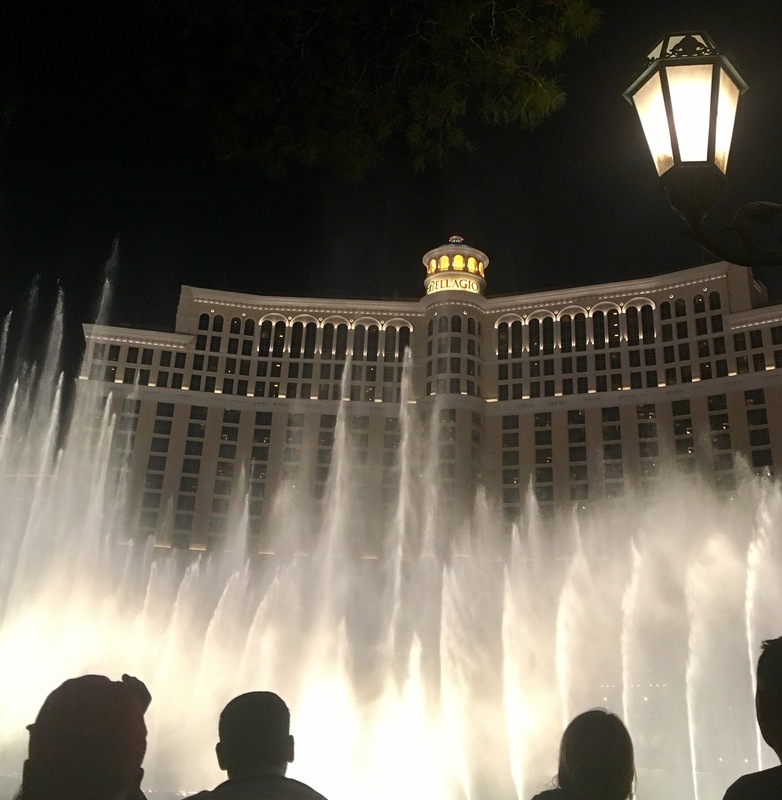 What touched me moreso that usual this time was the Bellagio Fountain show due to the song playing as the waters danced – God Bless the USA. I think they’ve had this song playing before, but this time it really hit home. Hopefully the video went through. We did spend our first day and evening on the strip, just to breathe in that Vegas air. Started with some chillin poolside – this is an excellent time of year to be here because it’s not too hot, but still great pool weather. I recently started to read books for fun again and finding the time to do that is so luxurious! 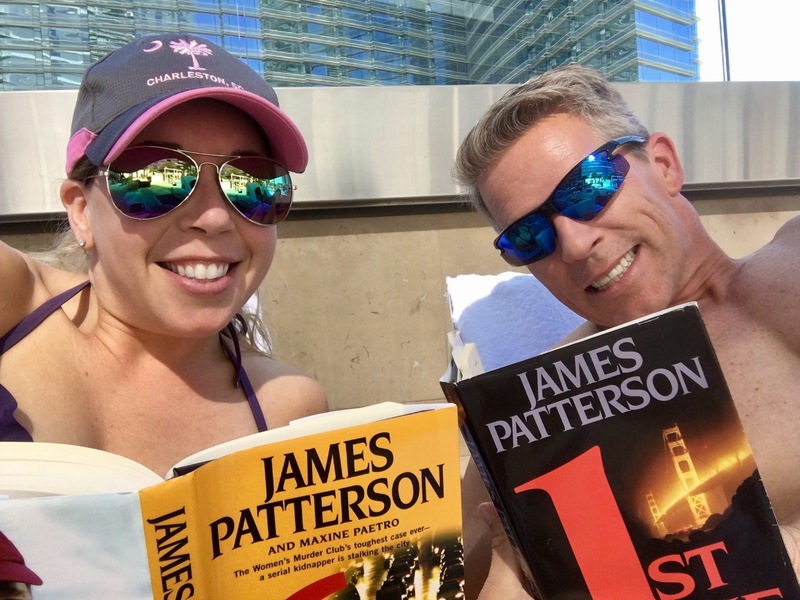 Plus I’m totally hooked on a James Patterson series and even got the hubs into it. A lovely afternoon by the pool and then time to get ready to hit the town for the evening. Last time I posted about Vegas, I think I covered Olives in the Bellagio, which is where I usually go my first night, so I won’t repeat that. Instead, I’m skipping right to day 2, my favorite part of this trip. 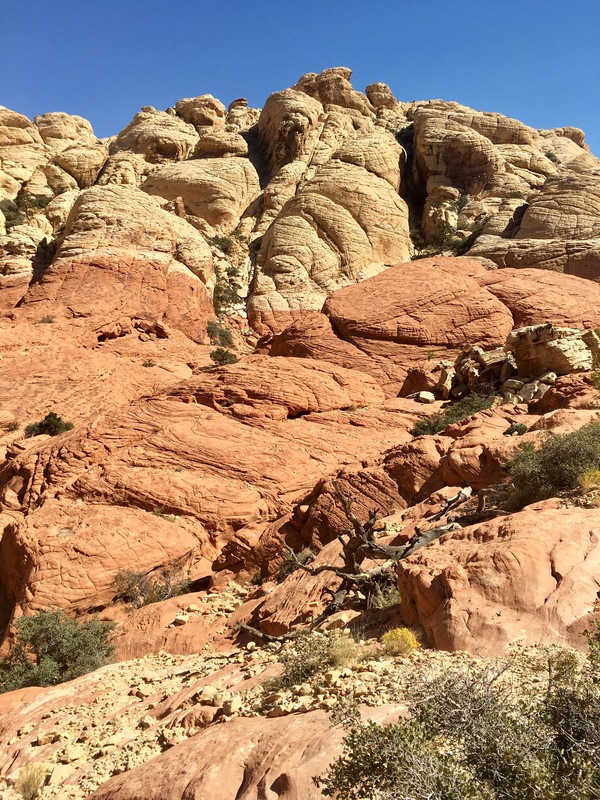 Hiking in the Red Rock Canyon. It’s only about a twenty minute drive from the strip. 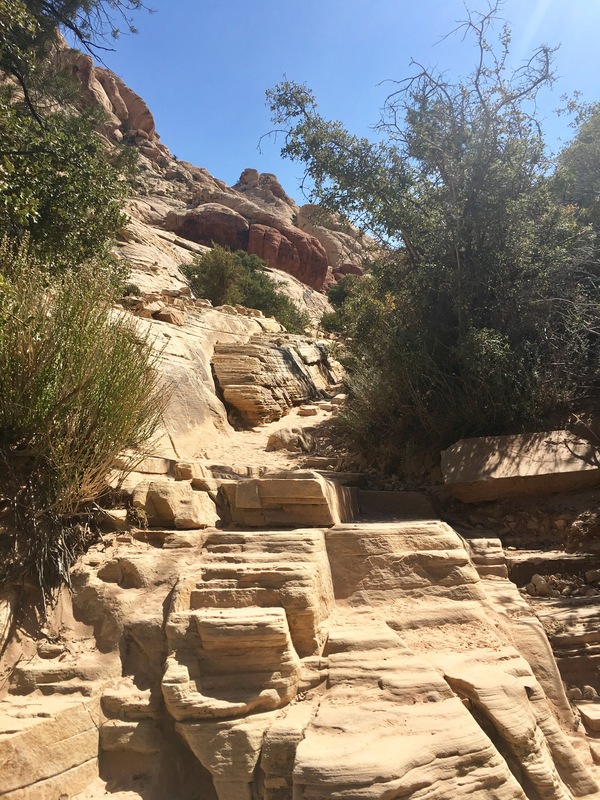 This place has over two dozen different hiking trails of varying degrees of difficulty. We were looking for a challenge, but not more than 2-3 hours. The Calico Tanks trail was absolutely perfect. You could meander off the trail and hike high or low through the canyon, which we did plenty of. The rocks were smooth but easy to grip with hiking boots. I can’t wait to do more trails here! 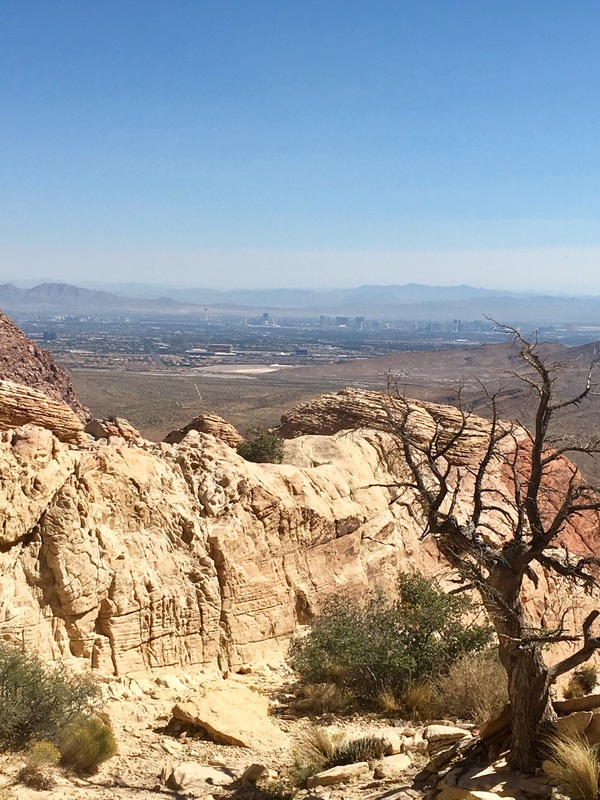 From the end of the trail, you can see the city of Las Vegas! Yes, I conquered. It was fabulous. And pretty physically challenging. There’s also a scenic driving route if you’re not into hiking, but there are some really easy trails, so you’ll be fine! 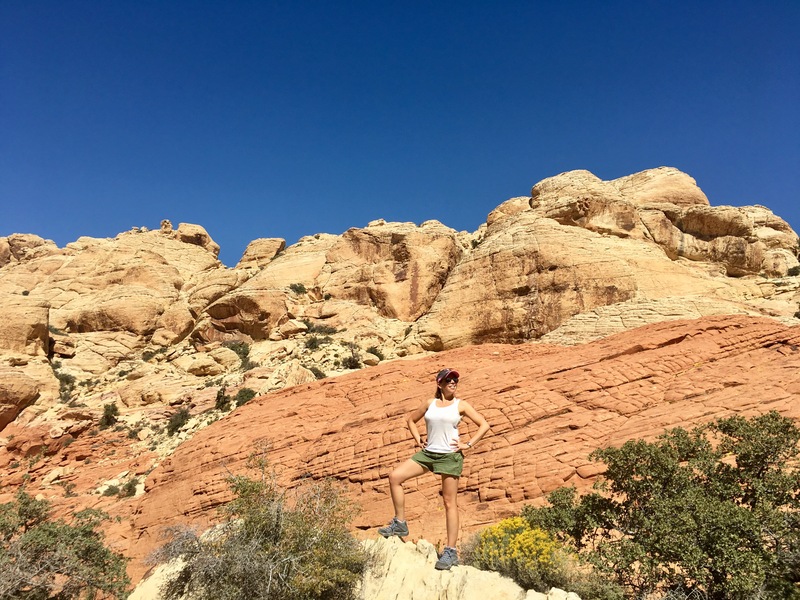 And if you follow this blog, which is mostly healthy eating, you’re probably fine with the moderate to strenuous hiking too!! Can’t wait to go back here and try some other trails. Later on for a quick bite and since we burned plenty of calories during the hike, I had an urge for some secret pizza. This pizza place has no name and is hidden in the Cosmopolitan on the third floor. I call it secret pizza because someone told us that’s what it was the first time we went, but I don’t know if that’s it’s name. It is, however, great to satisfy the pizza urge!! 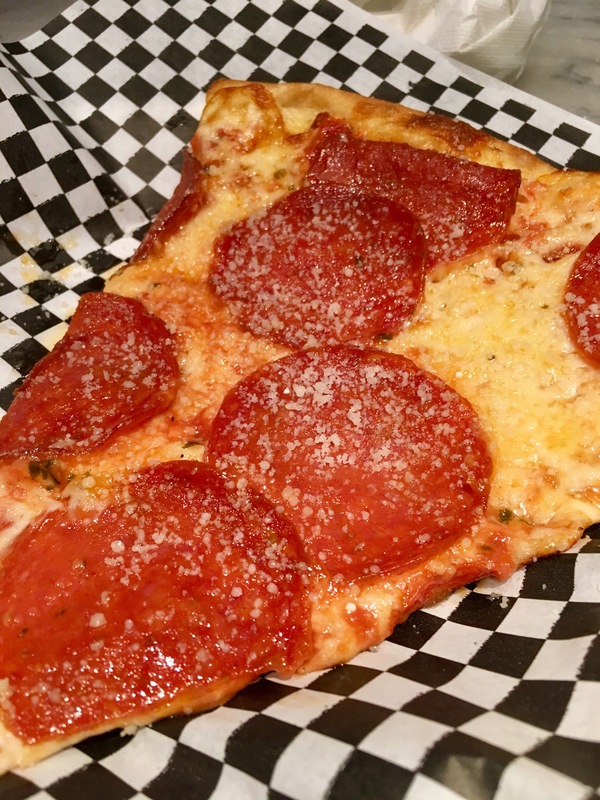 One big slice of pepperoni please! Another tip about secret pizza – the box of red wine here ain’t bad, it comes in a big cup, and only costs six bucks! Perfect walking around wine. Ahh, it’s nice to be able to carry around openly a cup of wine! Keepin it classy, Vegas. More to come so stay tuned!! Who’s that guy behind the bushes?